President Donald Trump meets with health insurance company executives. Despite reports that spell big trouble for lawmakers who promises equal or better coverage following repeal of the Affordable Care Act, President Donald Trump said Congress must move forward with sweeping changes to his predecessor's healthcare reform law. Trump told dozens of governors who met with him at the White House that the nation's health care system was in danger of imploding if he and Congress didn't remake Obamacare. But the pressure of keeping those who obtained insurance because of the ACA increased over the weekend after those governors gathered for their annual meeting received a sobering report on the impact of repealing the 2010 law. Avalere Health consultants were commissioned by the National Governors Association to analyze how state budgets and residents in expansion and non-expansion states would be affected by congressional Republicans' proposals to change Medicaid into a per capita program or one that distributes block grants. Republicans in Congress are floating the ideas as a alternatives to rolling back Medicaid expansion made possible through the ACA. About 10 million people gained coverage through Medicaid expansion that took place in 31 states and the District of Columbia. The Avalere report said states that expanded Medicaid would face the deepest cuts to their budgets. While the Trump administration said it would work with states as it repeals the ACA, some House Republicans have suggested limits to federal Medicaid funding in exchange for state flexibility. That proposal does not sit well with Republican governors who expanded Medicaid under the ACA, including Gov. Brian Sandoval of Nevada. "Nevada is one of the fastest-growing states in the country, so if you benchmark me three years ago, that's something that's going to punish Nevada," Sandoval said. Gov. Daniel Malloy, a Democrat from Connecticut told news service InsideHealthPolicy.com that he and his peers met with HHS Secretary Tom Price this weekend and that Price said states which accepted block grants would be given federal funds to cover only childless adults with incomes at the federal poverty level. The ACA allowed Medicaid eligibility to be expanded to 138% of poverty level. States would be free to design their Medicaid programs and patient advocacy groups fear that could lead to cuts in benefits. Providers worry their reimbursement rates, already much lower than Medicare, would be cut. Reduced Medicaid spending could also hurt hospitals, which for the past several years have driven job creation in the nation in part because of the demand of more people with insurance coverage. The cap has received support from other GOP governors, including Gov. Matt Bevin of Kentucky, who has criticized the expansion in his home state. "The net result has been a remarkable decline in access to health care coverage," he said. "More people covered, but covered by what? Fewer people able to actually even see a doctor." The Avalere report said any disruption to ACA-implemented coverage expansion might also expose consumers to new costs, which might cause them to drop their coverage. Republican Gov. John Kasich of Ohio said he thinks "there's going to be a problem in the House of getting anything out of there that still provides coverage to people. That's why the Republicans have to reach out to some of the Democrats. I don't know whether this is going to happen," he told CBS' "Face the Nation." The Associated Press obtained a draft of a proposal by GOP governors that urges Congress to change Medicaid from an open-ended federal entitlement to a program designed by each state within a financial limit. Some of the governors behind the proposal, including Kasich, opted to expand Medicaid in their states despite pressure from conservatives. "I think there are some very conservative Republicans in the House who are going to say just get rid of the whole thing. And that's not acceptable," he said. He added: "Republicans can go and do what they want, and I'm going to talk to them. But at the end of the day I'm going to stand up for the people that wouldn't have the coverage if they don't get this thing right. And I happen to believe that the best way to get this right over time is for actually both parties to work together. I know that's considered an impossibility now, but what's at stake is not some political thing. What's at stake here are 20 million Americans." Both Republican and Democratic governors urged Congress to move slowly to implement any repeal of the ACA, warning that states needed time to adjust their budgets and find other options for residents to keep insurance coverage. 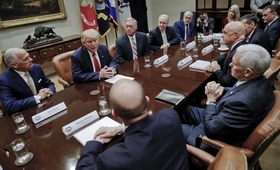 Trump also met Monday with health insurance executives, some of whom are worried that the uncertainty over the health care law's future is spilling into the marketplace. The insurers said that Trump and HHS Secretary Tom Price pledged to stabilize the insurance markets and bring down costs in the industry. "President Trump and Vice President Pence were very clear that they will work toward a clear transition," said Dan Hilferty, CEO of Independence Blue Cross.